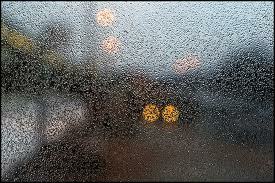 Drizzle consists of very small raindrops, larger than cloud droplets, but smaller than normal raindrops. It usually occurs when updrafts in clouds are not quite strong enough to produce rain. The clouds that produce drizzle have low bases, usually less than 1,000 feet in altitude. Fog is often present when drizzle falls. Like rain, drizzle drops grow as cloud droplets collide and combine with each other, but then fall out of the bottom of the cloud before thay can grow into bigger raindrops. FREEZING DRIZZLE: In the wintertime, freezing drizzle can occur if it is produced in clouds forming in a warm air layer overlying a shallow cold air layer whose surface temperature is below freezing. The layer of air must be shallow enough so that the drizzle drops do not have time to freeze before they reach the ground. Freezing drizzle can occur at surface temperatures as low as 10 degree F, or even lower, if the cold air layer is very shallow.